Having guests for dinner is all about pre-preparation and ease of cooking at mealtime. Here’s one that fits the bill for me. Actually that’s a lie. I use the ease of cooking this chicken “ä la minute” to allow me time to prepare a rich mushroom risotto, which pairs incredibly well. Throw in steamed and buttered asparagus with a bottle of Chardonnay, yes Chardonnay, and job done. To make the words easiest stuffing, tip the leeks, butter a pinch of salt and ¼ cup of water into a high sided fry pan to sweat down gently, stirring occasionally on lowish heat till barely softened. Don’t let the leeks brown or even start frying. Tip in more than half the breadcrumbs and stir through to mop up all the moisture. Keep adding breadcrumbs until you have a light, thoroughly moistened stuffing that when gently squeezed will hold its shape. Now season with salt and a little on the heavy side with pepper, realising your seasoning for the chicken as well. Taste as you add, making sure you mix well. Using the tip of a very sharp little knife, cut a slit through the side of the chicken breast, only up to 2/3 the length of the thickest part of the breast, creating a pocket. Fill each breast with enough stuffing, and with cupped hands over the top gently shape the breast and stuffing into a fuller version of its original shape. Wrap each breast tidily (as in the picture) with 2 slices of prosciutto, having the ends finishing on the resting underside. Leave the parcels loosely covered in the fridge for at least an hour, which allows the prosciutto to adhere. Switch oven to 190C to preheat 15mins before cooking. In a heavy bottom, oven capable fry pan with only a lick of oil, seal and brown first the underside of the breast and then gently turning, browning all over. Pop into the oven for 18 mins and then remove pan, cover with foil and let rest 5 mins. Careful of the hot handle. 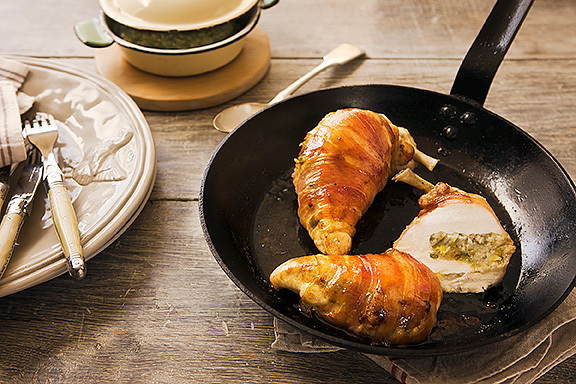 Carve perpendicular to the rested breast and lay out on heated plates. Serve as I described above with mushroom risotto and asparagus, or mushroom, sage and Madeira sauce.